Windows 10 automatically download and install updates for Operating system and devices as well, sometimes updating driver may cause many major issues including a few frustrating blue screen of deaths, accidental data corruption and blank screen issues in your laptop, desktop or tablet. You can stop Windows 10 from downloading updates and drivers to avoid these problems, or if you are already facing such issue, you will need to reset your Windows 10 once and then apply these steps to stop future issues. Windows 10 deliver universal drivers for all hardware on your machine by default, and this is major reasons why some of the users may want to stop automatic driver updates with Windows Update. Windows 10 updates are mandatory for Windows home users and Pro and Enterprise user can adjust their timing for an update, and this is creating lots of issue in Windows 10. Many hardware brands are serving drivers for their products through Windows update, but most of the devices don't support every driver at all. This creates lots of issue with OS regarding hardware driver issues. This issue can be easily resolved by updating your hardware drivers on your own and disabling hardware driver update through Windows update. You can turn off Windows driver update from "Advance system settings" for hardware. Open system properties (search system or open This PC's properties). Now click on advanced system properties. Choose "let No, let me choose what to do". Now select options according to your need. 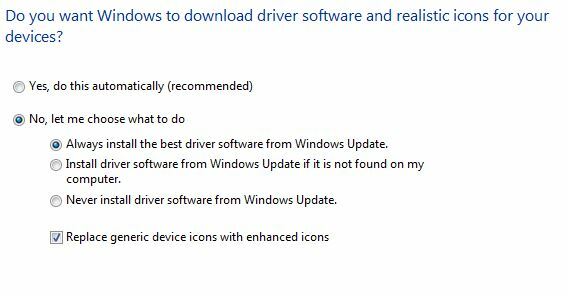 If you want to stop automatic updates of the driver from Windows update, then choose "Never install driver software from Windows update." This option will stop Windows update from installing drivers for unknown and known devices. Windows 10's update push feature is perfect for some users who are struggling to find drivers for their hardware but in many cases, default drivers may create an issue like bluescreen, lagging of display in case of the wrong version of drivers or latest version not compatible with hardware.